1) Get seams to be plotted as a dotted line? 2) Get the piece annotation (Piece Name, Pieces Cat, Pieces Description and Date) to be plotted inside of the piece. You need to set up your Annotation table. It needs line type "S" =LT2 for dashed lines. 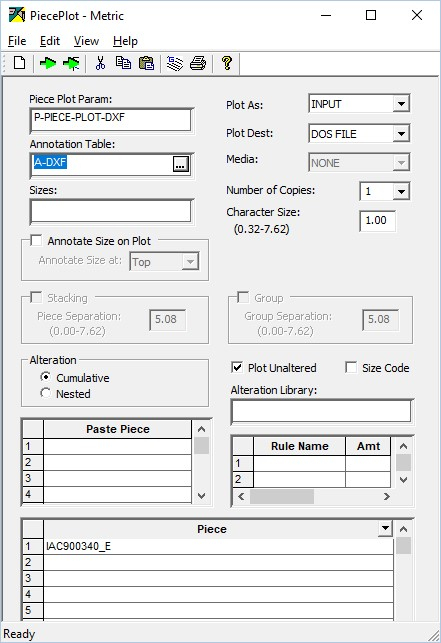 The online help file inside this editor explains the selections for what you want to plot on pieces and how to specify line type. We teach this in basic training classes Have you had formal training? Specifies which line type you want to plot; used in conjunction with LABELx. Type LT0 to plot no line. Type LT1 to plot a solid line. Type LT2 to plot a dashed line. Commonly used to specify different line types for internal lines. Been using Accumark since 1990 and over the years had many training sessions. I already have LableS = LT2 set in my Annotation table but when opening in AutoCAD via DXF Plot export my seams shows as a solid line? As for the Piece annotation, I would like to show under the grain line but they show outside the pieces. Nothing has changed with annotation and the LT2 dashed line. You previously asked how to get seams to be plotted as a dotted line. Here you are asking why the lines are not dashed opening in AutoCad. Are you plotting the dxf file directly to a plotter or importing and converting the data into AutoCAD? Accumark Explorer, Right click on piece, Send to plotter, Process. I then find the piece where I processed it to and open in Cutworks. I open in cut works DXF file and change the scale from cm to mm as a simple Open(cm) and Save As(mm) . I then send this file off to another engineer to plot the DXF file. The file is then plotted and the seam lines comes out as a solid line. 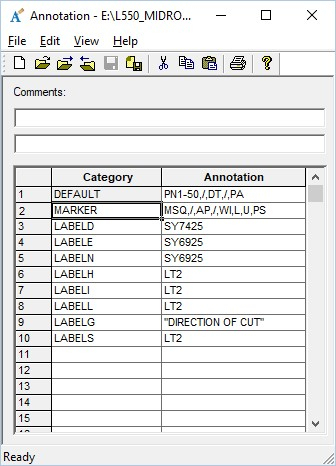 Is the A-DXF Annotation table in Piece Plot the one that has LT2? Also, do you plot each piece like this? 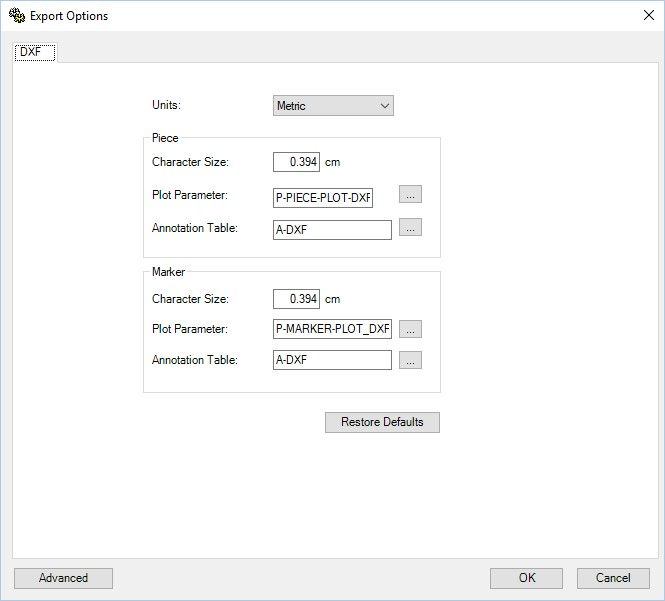 Are you aware you could plot the entire style from PDS for all the pieces in one DXF file? I suspect the file is losing the dashed lines after you process it in Cutworks and resave the DXF file because at that point, it is reading the DXF layers in Cutworks. To confirm - plot the DXF file you generate in AccuMark BEFORE sending to Cutworks. Do you have dashed lines at this step in the process? I suppose a DXF not support dashed line. What you do there with file in CutWorks except scaling? What plotter and software are usen to plot? I forgot to add the image of the P-Piece Plot where it shows Label 'S' to use a pen. Yes I plot all pieces like this as I use same method for markers but send as GEN files for the cutter. Its much easier for me to do this and have Markers set to GEN and Pieces set to DXF. I've added my export options image. 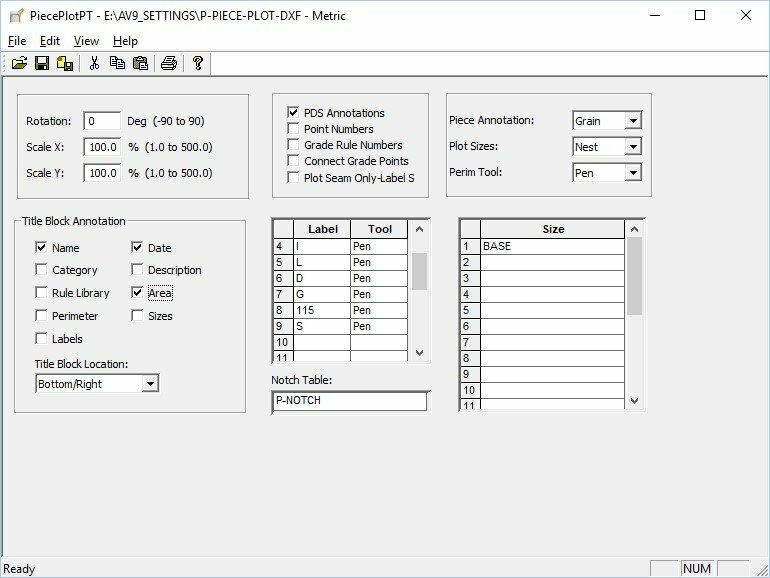 I have tried exporting ASTM DXF, plotting from a marker, plotting from a model, plotting fro PDS, export from PDS all without any luck. I also tried not using cutworks and opened directly in AutoCAD but get the same results. I cant think of anything else to try. I only use CUTWORKS for Scaling nothing else as its so much easier to try and scale using CUTWORKS than in autoCAD. @Beverley, what problem to use hpgl instead DXF? The ASTM DXF Options are very different from Standard DXF Options and AutoCAD and Cutworks. ASTM supports sew lines as a layer and you can manage the output. On the other hand, standard DXF files do not support the seams in the same way. If the end goal is to plot the patterns with dashed lines, you will need to keep the processes between markers and pieces separate and export as ASTM DXF or generate plot files as HPGL. 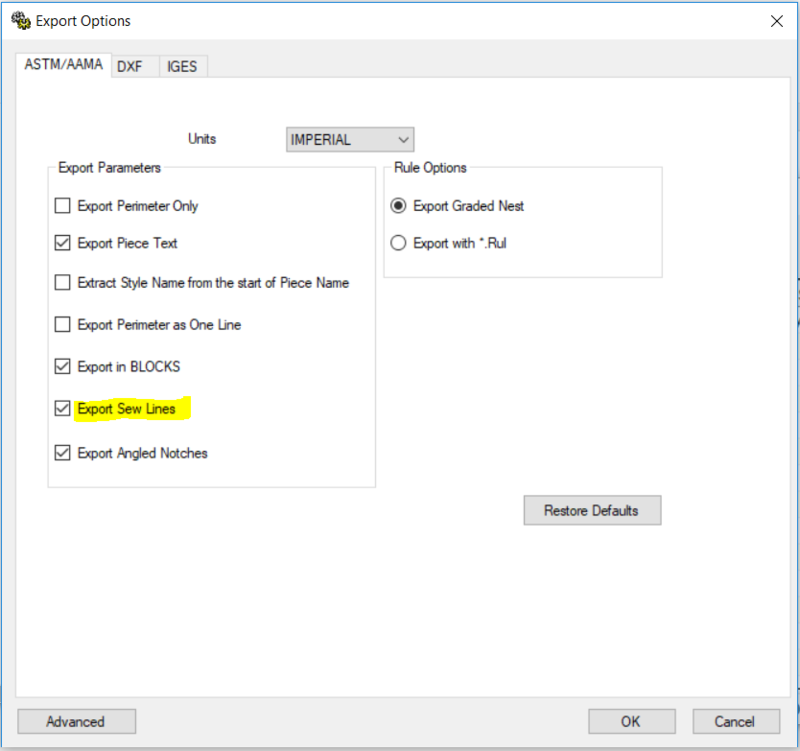 See example of ASTM Options for seams.